Daum Kakao, the $7 billion Internet company that owns messaging app Kakao Talk and recently bought Path, has turned to youth after hiring a new CEO to push its business forward and grow overseas. The organization, created last year when messaging firm Kakao merged with desktop Internet firm Daum, is replacing its existing co-CEOs (who stayed on after the merger) with Ji Hoon “Jimmy” Rim, the 34-year-old founder of Daum Kakao-owned VC firm K Cube Ventures. Rim, who spoke at TechCrunch’s Meetup event in Seoul in April, has been selected “to help accelerate the speed of mobile innovation,” Daum Kakao said. Rim, formerly a principal at Softbank Ventures Korea, founded K Cube three years ago and, aside from being acquired by Kakao, the firm became one of the most notable in Korea, with more than 50 investments. His appointment is due to be confirmed at a shareholder meeting next month, but Daum Kakao is already positioning his arrival as the next phase for the company. “The strategic decision to shift to a single CEO structure was strongly suggested and recommended by the two current co-CEOs of the company, Saehoon Choi and Sirgoo Lee. The co-CEOs have successfully completed the cultural, structural integration of Daum Kakao post merger, and have established a competitive basis for a new mobile life platform,” the company said in a statement. 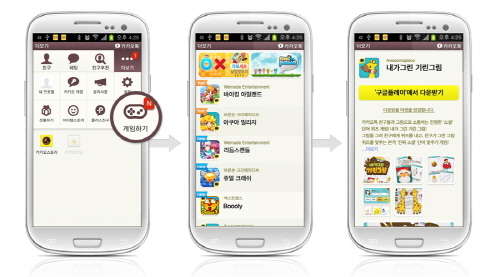 Kakao Talk is arguably the most influential mobile app in Korea. Installed on over 95 percent of smartphones in the country, beyond allowing free text messages, voice and video calls over the Internet, the service offers social games, brand marketing, mobile payments and a taxi-hailing feature, and it has plans for more services. While Kakao Talk has been a smash hit on its home turf, the service hasn’t translated that into international reach. Arguably the first of its kind in the world, it has seen Facebook Messenger, WhatsApp, Line and WeChat become more popular in Asia and other regions. Following the merger last year, Daum Kakao pledged to become more competitive overseas. The acquisition of Path earlier this year is the most evident example of this new focus, and it will be interesting to see what ideas Rim has for expanding the service overseas and retaining its dominance in Korea. “I will do my best to accelerate Daum Kakao’s transformation to become not only a prominent mobile company in Korea but also a competitive player in the global market,” Rim said in a statement. Kakao isn’t alone in switching its leadership this year. Japan’s messaging app Line, which is actually owned by Daum Kakao’s Korean rival Naver, promoted its COO to CEO in March as part of a new focus on its services business and growing its user base in Asia. The company is tipped to IPO in the future, but it is struggling to grow its revenue after suffering its first quarter-on-quarter drop in Q2 2015.